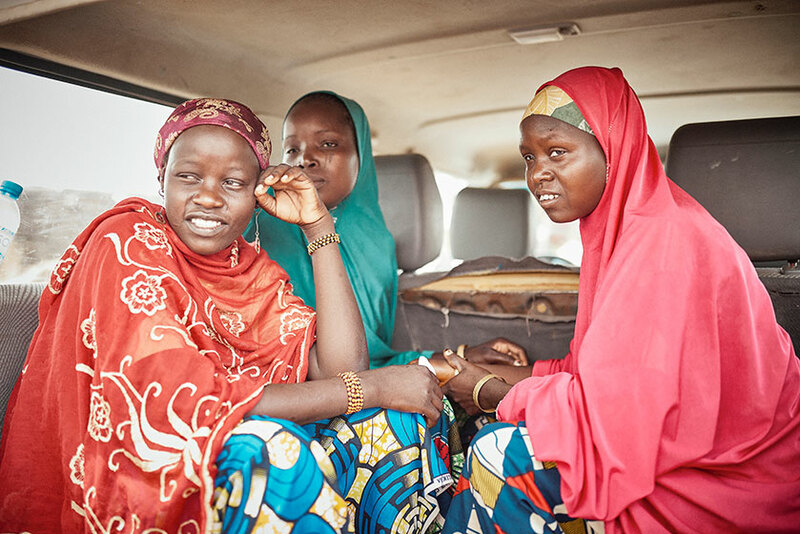 Rakia Ado, left, and two friends ride in an automobile for the first time in their lives, on their way to a temporary clinic in Niger to receive free surgery to correct a painful symptom of the infectious eye disease trachoma. 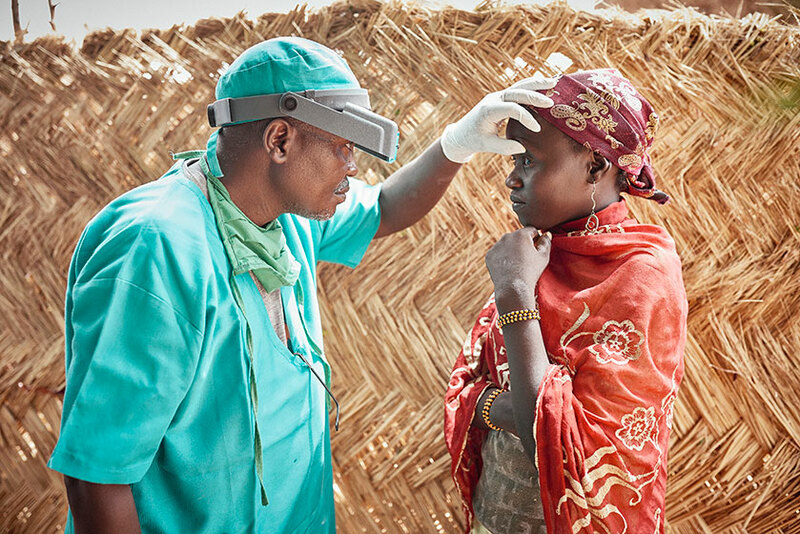 Dr. Abdou Ousseini, a public health physician in Niger’s Zinder region, examines Ado’s eyelids for trichiasis, a turning of the eyelashes that can permanently scar a trachoma sufferer’s corneas. 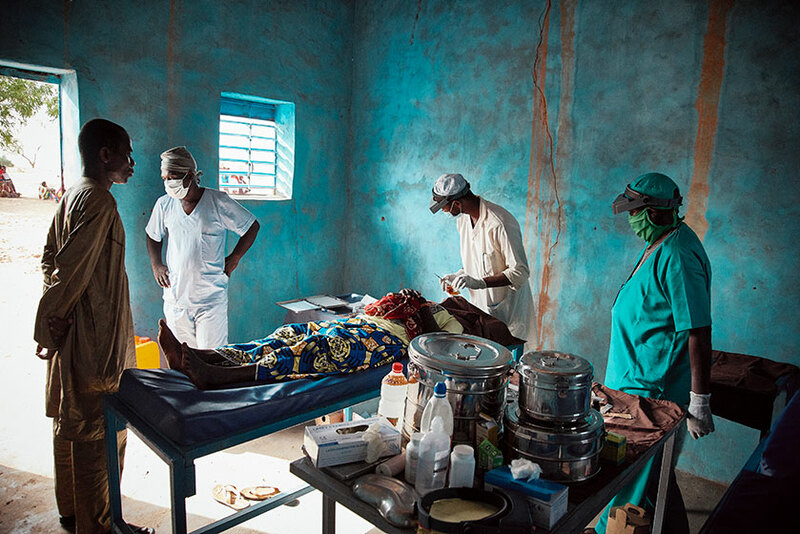 Haboubacar Mamane Nassirou, a 32-year-old nurse trained in trichiasis surgery by The Carter Center, prepares to operate on Ado, right, at a clinic in Hamdara, Zinder region, Niger. “I can operate on seven to 10 patients a day, depending on whether they need one eyelid or both eyelids done,” he said matter-of-factly. Ado lies still as Nassirou performs a simple outpatient surgery on her eyelids. Supervising at the foot of the table is Dr. Abou Yahaya, director of public health for the Zinder region. Ado’s eyes are bandaged after her surgery is completed. The procedures took 18 minutes to complete on her right eye, 12 minutes on her left. “This was a good patient,” the surgeon says. Rakia Ado is a decisive woman who is not afraid of the unfamiliar. 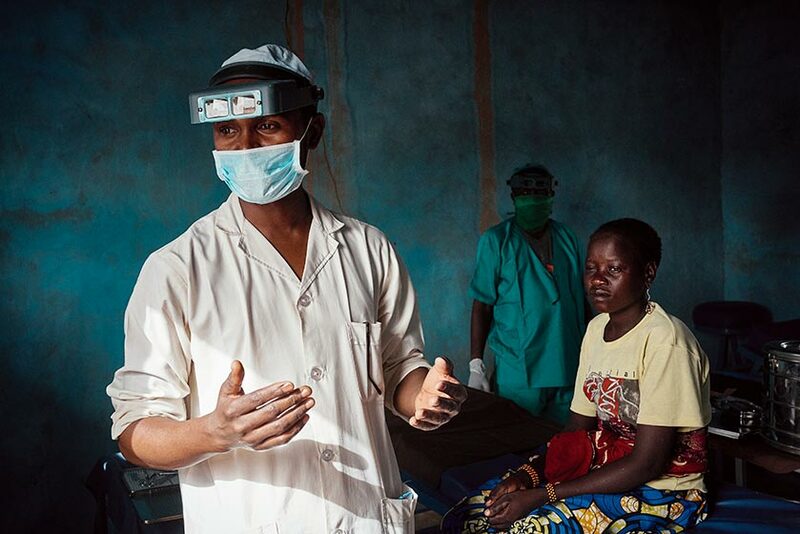 Ado, 20, was at home one day in Katirge, a remote village in southern Niger, when a team of government health workers and Carter Center staffers showed up. The workers, trained and equipped by The Carter Center, explained their mission and asked if they could examine Ado’s eyes and eyelids. She consented, and the diagnosis was quick: Ado had trachomatous trichiasis, a scarring of the inside of the upper eyelids caused by repeated infections with trachoma, a bacterial infectious disease that can lead to blindness. With trichiasis, the eyelashes turn inward and continually scrape the cornea, causing damage that impairs vision. “I can feel my lashes picking at my eyes,” said Ado, the married mother of a 2-year-old son. 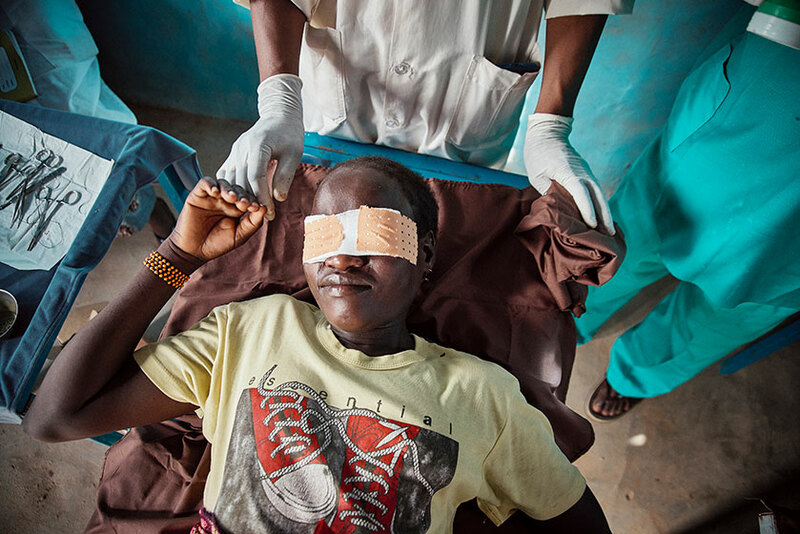 Trachoma is spread by eye and nose discharge on fingers, flies, and objects such as clothing. Because of their constant interaction with children with dirty faces, women are four times as likely as men to suffer trachoma infections. The Carter Center's Trachoma Control Program works closely with ministries of health and other partners to implement the World Health Organization-endorsed SAFE strategy for trachoma control. SAFE is an acronym for surgery (to correct the positioning of eyelashes), antibiotics (Zithromax, donated by Pfizer Inc. and mass-distributed for free in endemic areas), facial cleanliness (hygiene training to reduce transmission), and environmental improvement (the building of latrines to reduce populations of flies that can spread the disease). The health workers visiting Katirge offered to perform free corrective eyelid surgery at a temporary clinic set up in the nearby village of Hamdara, and Ado agreed immediately. “I don’t want to go blind so young,” she said. While someone went off to fetch the health team’s vehicle, Ado hurriedly took down laundry that was hanging out to dry and arranged for someone to watch her child. She and two neighbors who also had been diagnosed clambered into the back of a sport-utility vehicle for the bouncy 15-minute ride across the loose Nigerien sand to Hamdara. It was the first time any of them had been in an automobile. Ado and her friends chattered and giggled as if they were on an amusement park ride. 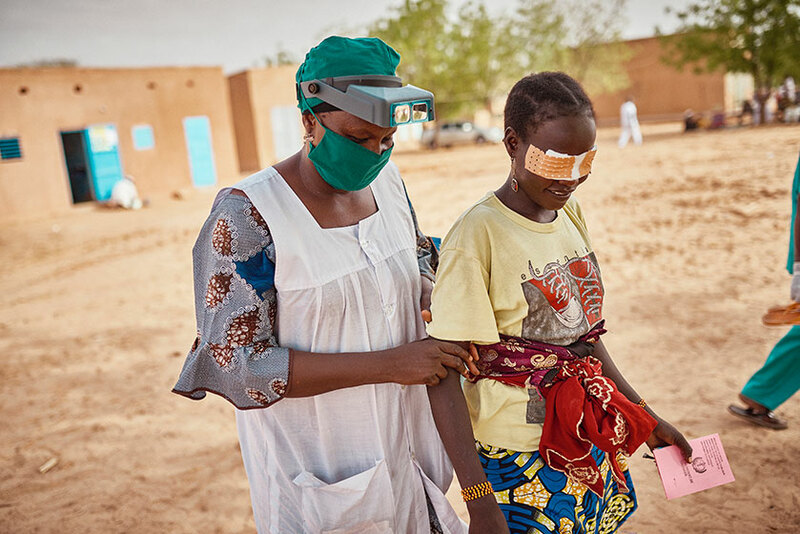 At the pop-up trachoma clinic, the three women listened while a female health worker explained what was about to happen. “I’m eager to fix this problem and get my full health back,” Ado said as she waited in the shade of a tree in the 34-degree Celsius (93⁰ F) heat — rather cool for West Africa at that time of year. Ado was led to the small building where the surgeries were being done. She washed her face with soap and water from a bowl and stepped inside, where she lay down on her back on an operating table shortly after 4 p.m.
Haboubacar Mamane Nassirou, a 32-year-old nurse, has been performing these simple surgeries for two years, including all this day. “I can operate on seven to 10 patients a day, depending on whether they need one eyelid or both eyelids done,” he said matter-of-factly. He usually works at a different clinic about 20 miles away but came over to help the busy team working in this highly endemic area. Nassirou placed a sterile drape over the face of Ado, who remained awake and placid throughout the procedure. An opening in the drape gave the surgeon access to her right eye. Nassirou used a sterile hypodermic needle to numb Ado’s eyelid with xylocaine; she didn’t flinch. After the numbing agent took effect, Nassirou, wearing surgical scrubs and a magnifying loupe, used a curved needle and thread to attach the eyelid to a spoon-like device that he used to invert the eyelid. As a colleague held a flashlight to augment the fading afternoon sunlight, Nassirou carefully made an incision along the inside of the scarred eyelid, allowing him to rotate the lashes back to their proper position. Ado remained passive, her ankles crossed and her hands folded on her abdomen. Nassirou dabbed at the incision with sterile gauze and sutured it closed. At 4:25 he was done; the entire procedure took 18 minutes. After moving the drape, Nassirou performed the same procedure on Ado’s left eye. This one he completed in 12 minutes. Nassirou and his assistant applied antibiotic ointment to both eyes, then covered them with a wide adhesive bandage that extended from temple to temple. Another health worker helped Ado sit up; she was beaming. That would be a temporary condition, as the next day she would return to the clinic and have the bandages removed. She was given a small amount of nonprescription pain reliever, oral antibiotic, and ointment to use for the next three weeks while her eyelids healed. The stitches will dissolve on their own. Within a few days, Ado’s eyelids should be completely healed and look perfectly normal. Now her future looks as bright as her attitude.